Yes, they are locking tuners, even without the big clunky thumb wheel. AND the posts are not only staggered but their height is adjustable. They also fit all 11/32" Strat & Tele holes, and require no drilling. Ratio is 15:1. If you've been thinking about a tuner upgrade, this may make sense for versatility and clean looks that won't spoil the vintage vibe either. 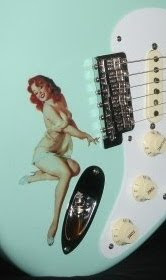 Ray's Custom Shop (eBay Store)- Good selection of tuners and guitar hardware upgrades. More Staggered Tuners - listings and suppliers-- Also, check out HipShot Griplock tuners!